Our £12 million refurbishment project got its dramatic reveal at our official launch party on 13 November 2014. It was an evening full of surprises for a targeted guest list of 250 clients, venue finding agencies, industry partners, prospects, media and centre staff, with the chief objective being to generate positive feedback and change perceptions of what types of events the centre can deliver, beyond the traditional conference. With walls flooded in icy blue lighting, candle-lit lanterns buried in mounds of fluffy white snow and an ice sculpture etched with an iconic Big Ben scene, guests to the QEII Centre were welcomed into a winter wonderland inspired foyer for champagne, served from a mirrored pop-up bar, which glimmered purple and blue as it reflected the revamped area’s new, customisable lighting. 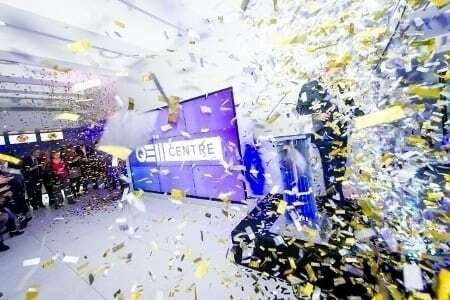 It was a wow-factor moment for those who hadn’t yet experienced the new-look entrance to the centre. Now vastly spacious, bright and welcoming, with stylish terrazzo flooring, raised ceilings, a concierge desk, video wall (which featured real-time twitter reactions from guests) and sleek airport-style check-in desks, the entrance is a world apart from the dingy, retro look of old. The centre then turned up the heat as guests shimmied upstairs into the tropical themed Pickwick Suite to the sizzling sounds of Cuban band Kandela mi Son and the energetic moves of ultra-glam, feather-clad Samba dancers from Brazilian Fantasy. Tropical scents flooded guests’ senses as they imagined themselves in a beach-side cocktail bar. Showcasing the three key areas refurbished – foyer, staircase, Pickwick Lounge – the aim was to create two contrasting themes to stretch guests’ imaginations, immerse them in an experience and demonstrate the capabilities of the QEII Centre’s in-house events and catering teams. We injected a social sharing element to the evening to highlight that QEII Centre is on-trend with technology advancements and event buyers’ desire to share their experiences through images. Our Instagram photo booth by Social Playground saw guests Instagram themselves posing behind our handheld frame with the hashtag #QEIILookAtMe. These posts then flooded a large TV screen in real-time acting as a storyboard for the night’s escapades. Of 250 guests invited, 209 attended, including 10 journalists from key event trade titles. Stylish remodelling of interiors and investment in high speed, next generation technologies have future-proofed the venue for years to come, making it a modern and highly functional space that clients from all over the world can make their own. The customer service experience is first class too, evident in the high volume of repeat bookings (70%) and the welcome is newly reenergised, with a new concierge team, a bright and spacious new foyer and a more discrete day-to-day security presence. These improvements coincided with strong financial performance, with 2014 contract values exceeding targets. Room hire revenue grew 18.69% and we’ve seen the best ever trading results across all income streams since 2009/10. Our year-end occupancy forecast is now 17.48% ahead of last year, while the total number of events we hosted has increased by 20%. Enquiries for awards ceremonies and dinner parties have already increased.